In North America forced air heating is still the most popular because of its low installation costs. However, it is the most expensive type of heat to operate and the least comfortable. When a forced air furnace comes on, a blast of warm air blows into the room for a short time and spreads through the room, carrying dust, pollen, and other air-born pollutants with it. Living in a house with hydronic heating (radiant floor heating almost make you forget that it’s winter outside. There is no other heating system that comfortable. Heated floors deliver warmth to the skin and clothing without overheating and drying out the surrounding air. Hydronic Heating heats objects, not air, to provide superior comfort. People are surrounded by radiant warmth, and the air temperature is uniform from floor to ceiling. The floor then becomes a heated mass, which radiates its heat to heat all bodies and objects above it. These objects, in turn, re-radiate the heat, heating other bodies in the room. Since hydronic heating warms bodies first; less energy is needed than with heating systems that heat the air to warm the bodies. The floor should never feel hot. When a lot of heat is not needed the floor will feel neutral – neither cold nor warm. On cold days, the floors will feel warmer, the colder it gets outside. With radiant floor heat, you can put the thick socks and slippers away in the middle of winter. However, the floor never becomes so warm, that it would be uncomfortable to wear shoes. It especially makes sense in houses and small commercial buildings with conventional levels of insulation and standard insulated glass windows especially those in climates with minimal cooling loads where the extra comfort of radiant heat is desired, and the budget allows. In buildings where air-flushing is common, such as garages, fire stations, airplane hangars, and industrial spaces (because the large-area radiant floor allows quick recovery). When building occupants have acute chemical sensitivity or allergies, in which case there may be concern that dust could be distributed through a forced-air system or that high surface temperatures from a gas burner or electric heating element will burn dust particles and cause health problems. 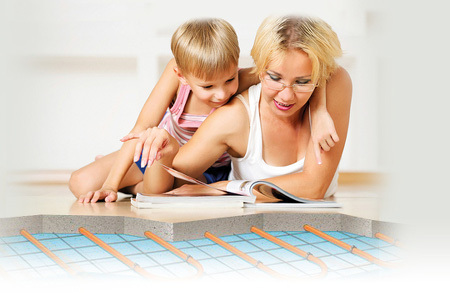 By far, the biggest selling point for radiant-floor heating is its comfort. The large radiant surface means that most of the heat will be delivered by radiation, heating occupants directly rather than by convection. 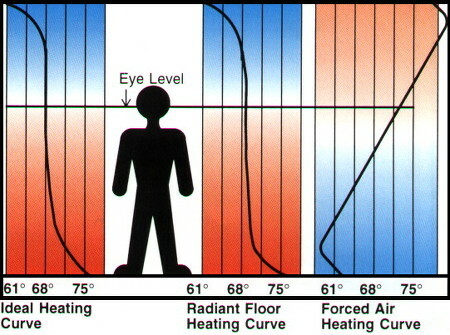 Warmer surfaces in a living space result in a higher mean radiant temperature (a measure of surface temperatures in a space that influences the rate of radiant heat loss from occupants). With higher mean radiant temperatures, most people are comfortable even at lower air temperatures. Studies conducted by the American Society of Heating, Refrigeration and Air-Conditioning Engineers (ASHRAE) indicate that with radiant heating systems, people can be comfortable at temperatures 2°C to 4°C lower than with convective systems. There is a potential for saving energy with radiant-floor heating through several mechanisms, including lower thermostat settings, lower-temperature boiler configuration, and reduced infiltration. Standard forced-air heating systems can significantly increase or decrease the air pressure in different parts of a building, which in turn can increase air intake rates at least in a conventional, leaky building. With radiant floor heating, as with hydronic baseboard heating, this will not happen. This approach works best with concrete-slab systems. Higher-temperature water is needed when the tubing is attached to the underside of wooden floors. While such systems are relatively complex and expensive, radiant slabs offer one of the best ways to make use of solar energy for heating portions of a building without direct access to sunlight. Backup heat is still needed. It can be provided with a wood stove, through-the-wall-vented gas heater, electric resistance heat, or backup heating element in the solar storage tank. Radiant hydronic floor heating is remarkably quiet. Unlike forced-air heat, there is no noise from a fan or airflow through ducts; and unlike hydronic baseboard heat, there is usually no gurgle of water through baseboard radiators or creaking from expansion and contraction. The only noise will be the sound of circulating pumps and the fan used in power-venting the boiler. With radiant-floor systems that have tubing attached to the underside of wood flooring, there may also be some creaking from expansion and contraction. Because there are no baseboard radiators or air registers with radiant-floor heating, there is much greater freedom as to where furniture can be placed. Radiant-floor heating systems are invisible. Houses with radiant-floor heat boast improved air quality. Compared with a conventional forced-air distribution system, there is likely to be less dust circulated in the home. And unlike electric baseboard or forced-air heat, there will be no surfaces hot enough to burn dust particles that could introduce volatile chemicals or toxic particulates into house air (even passing through filters). It’s hard to express doubts about something that’s popular. Like ground-source heat pumps, radiant floor heating has a loyal and zealous following of builders, designers, and homeowners who consider it to be the best heating option around and appropriate in almost any situation. 16 Things You Must Know About Radiant Floor Heating Radiant Floor Heat: Caressing Your Mind, Body and Your Soles… Solar Energy And Radiant Floor Heating Radiant Floor Heating – Hydronic is The Way to Go!